A good person centred dementia care is not possible unless it is supported by focused care plan. Our Consultant will conduct as detailed assessment, based on which detailed customised Care plan is prepared for your loved one living with dementia. The Dementia Care Companion is specifically trained to cater to needs of your loved one as per The Dementia Care Plan,to provide the efficient Care for your loved one. Who is Dementia Trained Care Companion? • Trained on Aspects of Dementia care, capable of handling symptoms of Dementia, certain dementia specific behaviours like Repetitiveness, wandering, forgetfulness, anxiety. 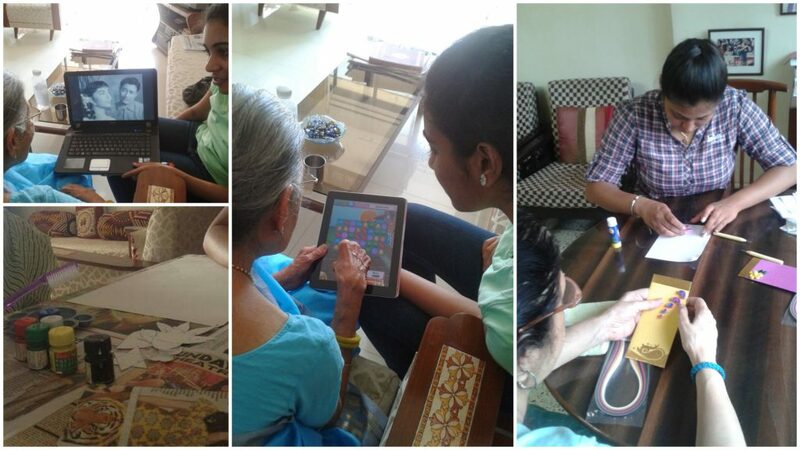 • Trained to provide stimulating, engaging activities for Person with dementia as per the customised Activities plan. • Can accompany Person with dementia for walks, short outings like museum, beach, cinema visits etc. • In special cases he/she can provide help in managing tasks in absence of Family carers due to emergencies or longs distance care giving .Responsibilities may include shopping, pharmacy visits, bills payments, hospital visits etc. Home based care to provide convenient care, focusing on well-being of person with dementia and the family. Bespoke detailed care plan for person with Dementia. Specially trained Care companions to cater to individual need of Person living with dementia. Monthly Home visits by Care consultant to review Dementia care. Regular session updates for Family members.